Ola, Uber's main rival in India, said Monday that as a first step it's aiming to roll out a fleet of 10,000 electric rickshaws in several cities over the next 12 months. 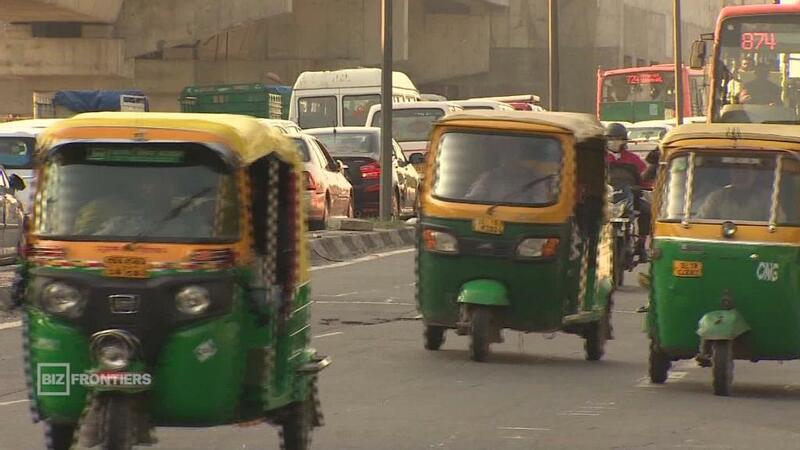 India's ubiquitous three-wheeled taxis are normally fueled by gas. Ola wants its drivers to switch to battery-powered versions. The company said it plans to hit the 1 million vehicle target by 2021. The Bangalore-based startup, which is backed by major investors such as Japan's SoftBank (SFTBF), did not elaborate on how it plans to grow its electric fleet so rapidly. It said it intends to work with vehicle manufacturers, city and state governments and battery manufacturers on the initiative. Ola currently has more than a million drivers across 110 Indian cities, so its plan would mean electrifying the vast majority of the vehicles available via its app. The Indian government has its own electric ambitions. Its stated goal is for most -- if not all -- vehicles on its roads to be electric by 2030. But the country faces several challenges in achieving that objective, including a lack of infrastructure and expensive technology for carmakers. Ola already runs more than 200 electric vehicles in the western Indian city of Nagpur under a pilot project it started almost a year ago. The project involves electric cars, rickshaws and buses. The company has also installed rooftop solar panels, charging stations and battery-swapping terminals in the city. Ola said Monday that its electric vehicles in Nagpur have so far clocked up more than 4 million kilometers (2.5 million miles). Other big ride-hailing firms are also boosting their electric vehicle fleets. Didi Chuxing, the dominant player in China, is offering electric car sharing in partnership with 12 companies including Renault (RNLSY), Nissan (NSANF) and Kia. Didi wants to have 1 million electric vehicles on its platform by 2020, a year before Ola. In November, Didi's fleet of partially or fully electric vehicles already stood at more than 260,000, according to the company. Uber also bought hundreds of electric vehicles from Mahindra -- the only carmaker in India that sells them directly to consumers -- last year. Ola currently has the upper hand in a fierce battle with Uber for control of the massive Indian market.